Vancouver is a great city for parents and kids, you just need to know where to look and where to go. Love Buns has been great at discovering all the possible things we can do in Vancouver with our kids. Some of these things exist in other cities too, so if you are not from Vancouver, you still might find this article useful. If you are from Vancouver, you will definitely find this article useful. This list is absolutely not exhaustive…I will continue to post more articles about things to do with the kids in Vancouver as the seasons change, because often the season has an impact on the things that you can do! Take a trip to a Family Centre. We take our son to the Mount Pleasant Family Centre and he loves it. It is a great place for parents and kids alike. They have nice drop in sessions that are well structured to include singing, playing, reading, snacks and more. They also have an adult lounge where parents can take a break, have a coffee and chat amongst themselves while the kids engage in supervised play. What more can a parent ask for. Have some fun at the Telus World of Science (Science World). This is absolutely a great place for kids with tonnes of fun things for kids to do. The beauty of it is that they learn a lot at the same time as well. We cannot pull our son away from some of the exhibits there. This is a great thing to do on a rainy day too! 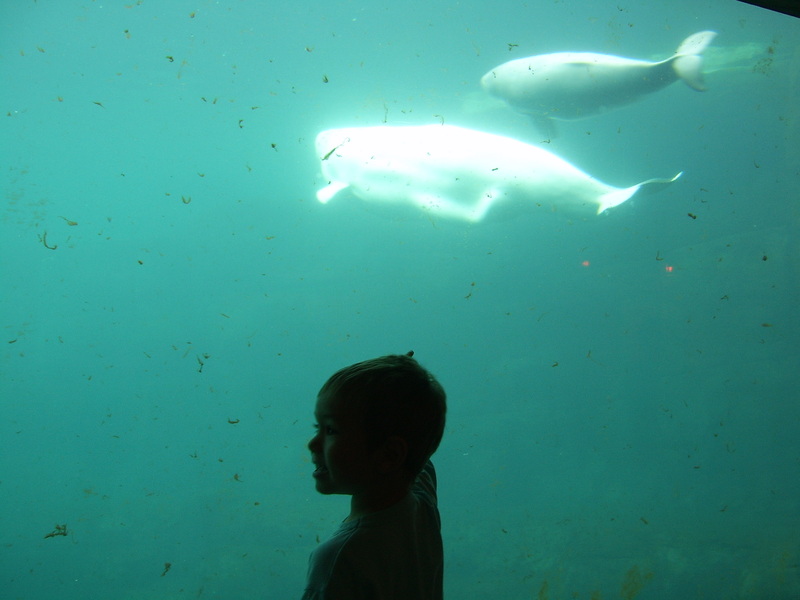 Explore sea life at the Vancouver Aquarium. My father-in-law just took Smarty Pants there the other day, and he couldn’t stop talking about it. There is lots for kids to see and do here, and they have a really nice play area for kids too. Some of the exhibits are interactive too, giving kids an additional opportunity to play. Also, the new Baby Beluga whale is a great attraction for kids. Climb, crawl and shop at the Granville Island Kids Market. The kids market at Granville Island has lots to do for kids of all ages. There is an arcade there with games where kids can win tickets to trade in for prizes, plus a big adventure zone where your kids can climb, crawl, jump and slide through an obstacle-course-like area. You can read about my adventure at the adventure zone here. Entrance to the Adventure Zone costs about $6 for a day. Just be aware that there are many stores with toys for kids, so set the shopping/buying expectations with your kids in advance! Go to a swapmeet. Swapmeet season is starting again, and we love to go to them. Swapmeets are places where other parents rent tables to sell their old kids stuff. You can buy clothes, toys, books and more there for very reasonable prices, and the stuff tends to be in good condition. As a bonus, a lot of the swapmeets that I have been too have a big play area for kids set up, so the kids can play with other kids while you look around and get some great deals. Stay tuned to this site for more details of upcoming swapmeets. As I find out about when and where they are, I will post the details here. Swapmeets are often held at community centres. Speaking of community centres, they are also a great place to do things with the kids. Find out where your local community centre is, and get a hold of their recreation guide. In there, you will find all kinds of things that you can do with your kids. For example, we go to the False Creek Community Centre. They have a “Tots Gym” drop-in that costs about $2.50 per drop-in. It runs in the mornings four days a week and is a great place to go on a rainy day. The kids can play in the bouncy castle or with lots of other toys that they have there, and you can meet and share stories with other parents, and discuss how much you love this site with them. If the weather is still okay, you can always still go to a playground. Vancouver has a lot of playgrounds where kids can play in the sandbox, climb on the monkey bars, go down slides, fly on swings and more. The main playgrounds that we go to in our area are the playground by the Granville Island Waterpark and the playground at Charleson Park. Get some books at the Library. There is actually much more to do at the Library than just read books. The Vancouver Public Library Central Branch downtown has a big kid’s library with lots of kid’s books, toys, computers with interactive games, and multiple play areas. Definitely worth checking out! Speaking of books, here is an idea that I had, where I brought Smarty Pants to a Chapters bookstore to play. You can read about it on this site here. Hope that list helps to keep you busy for a bit. Stay tuned for more, as this is just the start! Join the jam and leave comments with your own ideas on things to do with the kids in Vancouver, or in the city that you live in! Vancouver is the best place in all of Canada when it comes to having fun. You have Science World and the Vancouver aquarium on one hand, and on the other, you have nature in all its glory. One of my favourite things to do during the summer in Vancouver is go to Capilano park and hike all day, as well as swim in the river. It’s beautiful. Thanks HFIV for your comment! I absolutely agree, it is great. Great tip with Capilano Park as well!